As a Speech-Language Pathologist for Early Childhood Intervention (babies 0-3 years old) and more importantly a mom of 2 young children, early language development is always on my mind. It comes very natural to me. I truly love my job and its such a passion of mine. Research shows that the brain doubles in size in the first year of life, and is 80% of its full size at 3 years old. Those first few years of life are critical for language development! In this post I am going to focus on my 19 month old daughter and the things I do to stimulate her language right now. This by no means is a complete list of strategies to help your child with his/her language, just a few tips! Get down on your child’s level: This seems like a simple suggestion, but there is no better way to show your child that what he/she is doing is interesting and important to you. Kids often try to find a way to get to your level if you are not on theirs. They may climb on the couch to sit next to you, tug at your pants while cooking so you will pick them up, or want to sit in the high chair next to you while sitting at the table. One of the first means of communication between baby and mommy/daddy is eye contact. Children start focusing 8-12 inches from the face just days/weeks after birth. So, getting on the floor where their eyes are at your eye level is a great way to encourage communication. While face to face, over emphasize the way you move your mouth to make the sounds. Repeat sounds that your child says. Make eye contact and smile at your sweet little one! 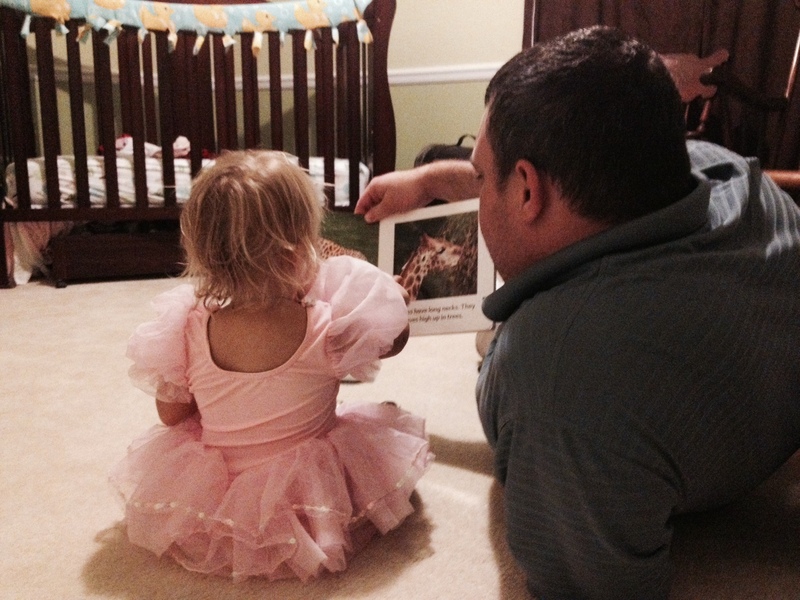 I caught my husband reading to our “princess” before bed last week. I love this precious moment caught on my phone! Read books: Reading to your children can start at birth. Young children may not look at the books, but you are establishing a routine early on that will hopefully become one of your child’s favorite times of day. You don’t really have to “read” the words of the books, just as long as you are engaging your child in looking at the pictures on the pages. Let them help you turn the page. Point to the pictures and tell your child what you see. When you are pointing to the pictures move from left to right to teach pre reading skills. Right now my daughter loves books like Brown Bear, any book of first words, books with flaps to open and find things, and SkippyJon Jones. Use lots of repetition: A study I read said typically developing children need to hear a word 50-75 times to understand what a word is, and even more to learn to say it. When you get tired of reading a book for the 100th time, remember that your child is memorizing the book and associating the words with the pictures on the pages. One of my favorite activities to do with the children I see is playing with farm animals. 2 sounds together (a consonant + a vowel- like ‘moo’ or ‘baa’) are some of the most basic easy sounds to produce and I start with these. Use the animal sounds over and over again with your baby. Simplify the number of words you use: Sometimes I find myself telling my daughter, “Go get your shoes A so we can go to school.” What I really should have said is just “shoes?” and looked around to try to find them. When she finds her shoes I say “shoes!” “Shoes on” Then when she sits in my lap I can show her the shoes again and say “shoe on” for both feet. Now I just modeled the word “shoe” 5 times for her. These were just a few suggestions to stimulate your child’s language. What are some things you do with your child to “teach them to talk”?